On Tuesday, March 19, 2019, a vertical string of 4.5-foot-diameter red balloons was floated at the approximate location and height of a proposed 195-foot cell tower off Buttermilk Brook Road on Freeman Ridge in Southwest Harbor. The public was invited to view the balloons and comment on the impacts that the proposed tower might have on nationally significant historic resources within a 4-mile radius of the proposed tower. Acadia’s trail system has been deemed eligible for listing on the National Register of Historic Places in large part because the trails were carefully sited to open Acadia’s scenery and the surrounding landscapes broadly to recreationists. Friends of Acadia took the opportunity to assess the potential impact of the proposed cell tower on two of Acadia’s trails, the Beech Mountain Loop and the Flying Mountain trail. The greatest impact was observed on the Flying Mountain Trail, where approximately 130 feet of the cell tower would be silhouetted against the sky above the Freeman Ridge tree-line. A composite, panoramic view from Flying Mountain in Acadia National Park of a cell phone tower balloon test on Freeman Ridge in Southwest Harbor on Tuesday, March 19. The red balloons are approximately 50 feet apart. The top one roughly represents the height of the proposed tower. A current cell phone tower on the ridge can be seen just above treeline at the left. Click on photo to enlarge. If one were to superimpose a representative image of a 195-foot cell tower over the string of balloons, it would appear like this. This composite, panoramic view from Flying Mountain in Acadia National Park includes a representation of what a typical 195-foot cell phone tower on the ridge might look like atop Freeman Ridge in Southwest Harbor. The top of the tower is situated where the top balloon appeared in the image above. The width and design of any actual tower might vary. Click on photo to enlarge. 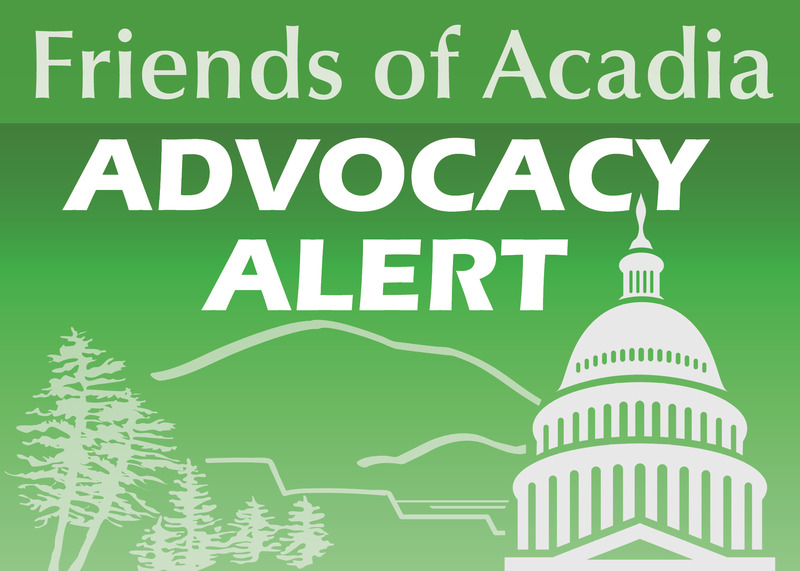 Friends of Acadia recognizes the importance of connectivity and communications, but feel those goals could be accomplished with a tower more in keeping with others on Mount Desert Island that FOA has not opposed. FOA is concerned that the proposed 195-foot cell tower would diminish the views from Flying Mountain and other trails, and therefore would harm the historic value of the trails. FOA provided comments to the consultants working on the visual assessment for BRT Group LLC, and copied representatives from the Federal Communications Commission, the Maine Historic Preservation Commission, and the National Park Service. While this stage of the process is focused on impacts to historic resources, there may be future opportunities to comment on the overall impacts of the proposed tower on the environment and community. Friends of Acadia will keep you informed of these opportunities. For more information about the process, click here. Contact Stephanie Clement at stephanie@friendsofacadia.org or 207-288-3340. As a property owner in Southwest Harbor I strongly support the judgement of the Friends of Acadia in the matter of the proposed cell tower on Freeman Ridge. I would appreciate your keeping me informed of any further action needed on the part of residents in this matter. I was honored to meet Earl at the top and hike down with him. My feeling incredulous after seeing what this proposed tower would do to the vista never actually left me. I still get short of breath thinking this kind of visual obstruction is even being considered by the local authorities. Thank you, FOA for your vigilance and process and for keeping us posted on actual benchmarks. The picture speaks a thousand words. As a member of FOA and a visitor to Acadia for the last 40 years, I strongly oppose the installation of a cell tower that would destroy the historic and inspiring views that ANP provides. Both Beech and Flying Mountains are my family’s favorites and hold so much meaning. We sought solace there after 9/11 and continue to do so as often as possible. We will be moving to SW Harbor this summer. Flying Mountain has been one of our favorite hikes over the years. A cell tower of this size would visually destroy the beauty of the view as well as that of the hike. I would be interested to find out what alternatives there are to a tower of this size. In my opinion an improvement to the cellular system is not worth such a despoiling of the appearance of the area. My family has been visiting Mount Desert Island for the last 20 years. I go there to get away, connect with the park, hike, take in nature. I don’t NEED my cell phone to “have better service”. I’m on vacation. This isn’t worth the scar on the natural landscape and beauty the island offers. I am STRONGLY opposed to the cell tower. As a resident of SWH that frequently hikes Flying Mountain, I strongly oppose the cell tower. One of the many reasons we live on MDI is to feel immersed in nature and have access to wild places. This tower would have a huge impact on how all of us, both residents and tourists, experience nature in Acadia National Park. I agree with Jean Dean. I am a property owner in Southwest Harbor. I know cell service is horrible and needs improvement but I agree with FOA that there is a way to do it without destroying the views from all the mountains. The fire tower is high enough. I come to Acadia every year to relax and recharge get away from looking at these monstrosities. This would absolutely destroy the views from any point with it being that high. If the choice is keeping the beauty or better service, I vote for keeping the view. I don’t need better cell service if it means destroying the Park. Please keep me updated on what is happening with this. Thanks for doing this. As a Freeman Ridge resident, I always thought the new tower would be of similar height to the one that already exists here. I had no idea how much bigger the proposed tower is. Please let us all know how we can help fight this.